Columbian President Juan Manuel Santos was awarded the Nobel Prize 2016 for Peace on 7 October for his efforts to bring the country's more than 50-year-long civil war to an end. Santos will receive the Nobel Peace Price for negotiating a peace treaty with the guerillas in the country, despite losing the referendum held over the deal. The war had claimed lives of at least 22,00,00 Colombians and displaced close to six million people. 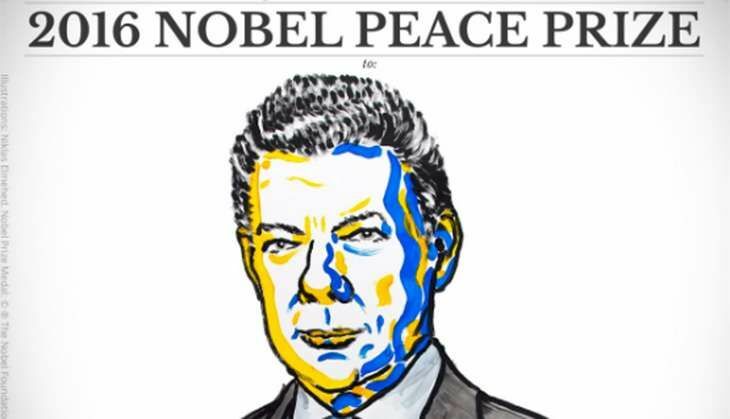 "The award should be seen as a tribute to the Colombian people who, despite great hardships and abuses, have not given up hope of a just peace, and to the parties who have contributed to the peace process," The Norwegian Nobel Commitee said in a press release. Juan Manuel Santos and FARC chief Rodrigo Londono, alias Timoleon "Timochenko" Jimenez, had until now appeared to be serious contenders for the prestigious award after signing a deal on 26 September to end 52 years of civil war. But when the historic deal was put to a referendum, voters in Colombia rejected it by a razor-thin majority, throwing the country's future into question. "The fact that a majority of the voters said no to the peace accord does not necessarily mean that the peace process is dead. The referendum was not a vote for or against peace. What the "No" side rejected was not the desire for peace, but a specific peace agreement," the Norwegian committee said. This year, the Norwegian Nobel Institute had received a whopping 376 nominations for the peace prize, a huge increase from the previous record of 278 in 2014.